The Margravial Opera House is the best preserved example of a free-standing Baroque court theatre. It was modelled on the greatest opera houses of the time in Vienna and Dresden. As a unique monument of 18th-century festival and music culture it was inscribed by UNESCO in the list of World Cultural Heritage of Humanity in 2012. The driving force behind this exceptional project was Margravine Wilhelmine of Brandenburg-Bayreuth (1709-1758). 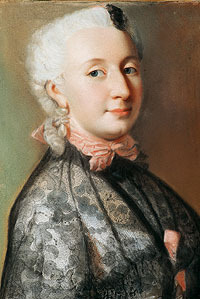 The Prussian king’s daughter and favourite sister of Frederick the Great chose opera as the most important arena for enhancing the image of the court. She was highly gifted in all the arts, wrote libretti and composed and engaged an ensemble of Italian singers at the Bayreuth Court. The theatre was built for the lavish festivities surrounding the wedding of Wilhelmine's only daughter, Elisabeth Friederike Sophie, and Duke Carl Eugen of Württemberg in September 1748. The wedding was celebrated with the performance of two Italian operas, banquets and theatre performances in the newly built opera house. The architect appointed to design the new opera house was the leading theatre architect of the day, the Italian Giuseppe Galli Bibiena who had been working for the Viennese imperial court. His son Carlo Galli Bibiena was responsible for the project in Bayreuth and stayed on at the court until the death of the Margravine, creating numerous stage set designs and festival decorations for the Margravial Opera House. The reconstructed Baroque stage set currently on display was modelled on a design by him. The front building and façade were only finished two years after the inauguration in 1748, and are the work of the Bayreuth court architect Joseph Saint-Pierre. The Margravial Opera House is modelled on Italian loge theatres of the period. The fully preserved tiers of loges made primarily of wood and canvas are installed as a free-standing construction within the stone exterior. The auditorium and stage form a single unit. The large stage portal framed by columns at the rear of the auditorium faces the court loge. The sculptures decorating the loge, like those above the stage, glorify the Hohenzollern dynasty and the founders of the theatre, Margrave Friedrich and Margravine Wilhelmine of Brandenburg-Bayreuth. The interior of the theatre was constructed in record time with some of the wooden architectural elements and sculptures prefabricated and painted elsewhere. 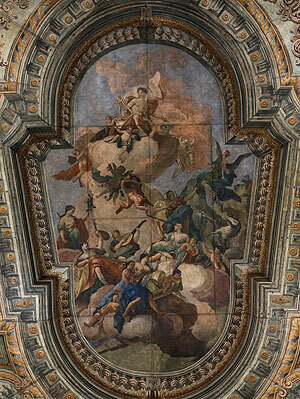 Under the direction of the architects Giuseppe and Carlo Galli Bibiena, a masterpiece of ephemeral festival architecture was completed from 1744 until 1748 in under four years. The restoration that took place from 2013 to 2018 re-established the original light and airy atmosphere of the illusionist painting in the auditorium with its overwhelming three-dimensional effect. The sustainable restoration work carried out on the opera house has now enduringly preserved the illusionist art of the Baroque age for future generations as well.